It worked! Here I am. Your Bread Blog is fantastic and I found Laura Mullet’s blog, read part, felt so happy and sent her a comment. Is this how one gets hooked on this social networking stuff? I’m happy I found your blog, and so quickly after its inception, via the Boutard’s market email. I appreciate the close attention you’re giving this tasty little cress. Indeed, it’s peppery and sweet – and certainly abundant. I would only caution readers to beware of its enthusiastic self-sowing tendencies. 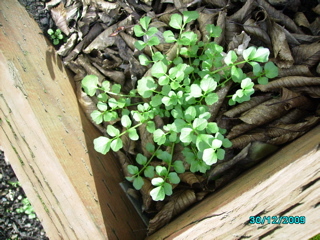 One plant will produce hundreds of seedlings. Too much to enjoy in salads, no matter how avidly you might try – it can quite take over! But it’s lovely to see a delicious “weed” profiled on a food blog. Thank you! You are absolutely right. 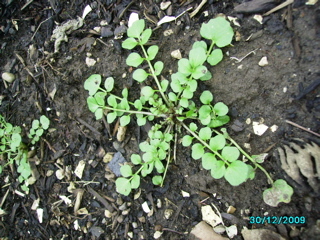 And I pull them up in my garden long before they go to see since they are a real pest. But, yes, fun for a few weeks before much else is around.